"Markets will likely remain treacherous in the New Year," Marc Chandler, chief market strategist at Bannockburn Global Forex LLC, told clients. MSCI's index of global equities <.MIWD00000PUS> gained 0.57 percent to bring the global benchmark to a weekly advance near 2 percent. 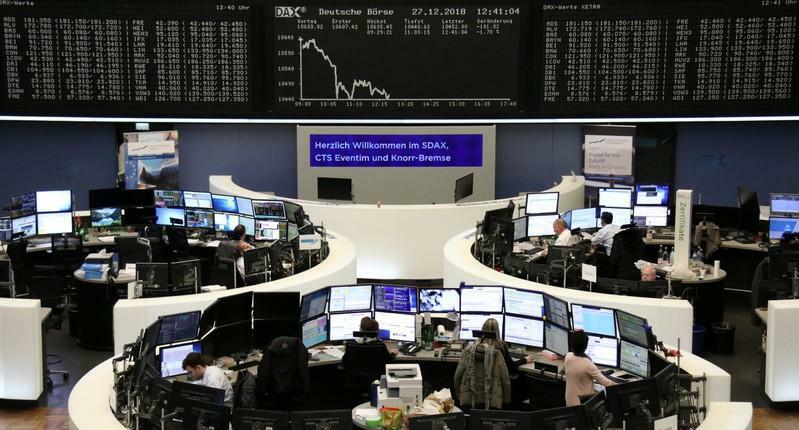 Markets swung wildly in a week shortened by the Christmas holiday, starting with Wall Street's worst-ever Christmas Eve drop, pushing the S&P 500 to within a whisker of bear market territory. The steady drumbeat of disappointing economic data reinforced caution, including Japan's slowing industrial output and retail sales, declining German inflation and U.S. data for November showing contracts to buy previously owned homes fell unexpectedly in the latest sign of housing market weakness. "If we get the transmission mechanism of a lower dollar, stocks outside the U.S. are set up for a good 2019," Bailey said. "Once people get their heads around the fact the U.S. is not going to have yet another double-digit return year in 2019, you can look elsewhere."